The School of Information Studies (iSchool), whose national reputation is built on innovation in the information field, has initiated a student programs development campaign with some twists. The effort is modeled on the crowdsourcing style of fundraising, and it uses a proprietary online system built by current students and recent graduates. 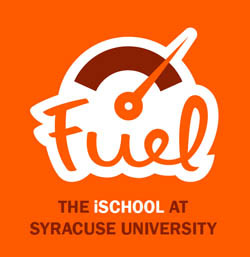 The iSchool’s “iSchool Fuel Challenge” kicked off Oct. 1. The online, crowdsourced initiative lasts for 60 days. Fundraising provides support to five signature student programs. The appeal reaches out to faculty, staff, students, alumni, parents and friends of the iSchool. Just like its well-known online funding website models, contributors and others who are interested will be able to watch the campaign’s progress as it occurs online and in near real time. As donations accrue and contributions come in, the total amounts raised for the programs can be tracked on a dedicated website: http://fuel.ischool.syr.edu. Students of Promise, which provides critical financial resources to students whose beyond-the-norm circumstances or family emergencies might otherwise force them to leave school. Modeled after successful online crowdfunding platforms, such as Kickstarter and Indiegogo, the online campaign and website was created and built by iSchool students and iSchool staff professionals. Andrew Bauer ’13 provided website development. Eric Cleckner ’10, G’13 did the website graphic design. Jared Mandel ’13 provided videography for student and staff videos, which describe the programs and the impact they have on individual learning and professional experience. “We want to especially thank and acknowledge the contributions of current and recent graduate students, whose skill and knowledge have been central to this innovative effort. Their efforts illustrate what an iSchool education, and belonging to the iSchool family, is all about,” notes Dean Elizabeth Liddy. To prompt the involvement of other alumni and to provide a leadership challenge gift to create momentum for the 60-day, crowdsourced initiative, alumnus Sam Clarvit, ’10, has provided a $5,000 challenge gift for the current School of Information Studies’ “Fuel the Future” campaign. Each contribution made to the programs counts as a vote for added funding. At the end of the campaign period, based on the total number of gifts each of the five programs receives, the programs can earn cash beyond the amounts pledged. The program that secures the greatest number of gifts will be awarded $3,000 in challenge funding. The second-place program will earn $1,500, and the third place program will earn $500 from Clarvit’s contribution (in addition to the monies contributed by donors). For more information and to make a gift and watch the campaign’s progress, visit the website.